Take your best pictures and make them better with editing. iPhoto includes most of the image-editing tools that casual photographers need to spruce up their photos. If you use iPhoto to manage your photo collection, try these fixes before cracking open a dedicated image editor. By default, when you select a photo and click on the Edit icon, iPhoto opens the image in the program's main window. But if you'd like to get a larger view of your edits—or you simply don't want to be distracted by other programs—you can choose to edit in Full Screen mode instead (see "Pick Your View"). To switch to Full Screen mode, click the Full Screen button in the lower left corner of the iPhoto screen, go to View -> Full Screen, or press Option-Command-F. To exit Full Screen mode, click on the X icon in the editing toolbar or press the Escape key. If you spend far more time looking at pictures in iPhoto than you do editing them, set the Double-Click Photo option to Magnifies in Preferences. That way, when you double-click on a thumbnail, you'll see a bigger version of the shot. However, when you do want to edit an image instead of just viewing it, all you have to do is hold down the Option key when you double-click. This takes you directly to Edit mode instead. In Full Screen mode, your Mac's menu bar, Dock, and entire desktop disappear to make room for iPhoto. This view is more than just a larger version of the usual iPhoto interface. It has been tweaked so that users get the most out of the expanded space. A simplified iPhoto menu bar that stretches across the bottom of the screen keeps clutter to a minimum. In the middle are buttons for Events, Faces, Places, Albums, and Projects views. On the right side of the menu bar is a secondary set of options that changes according to which view you are in. The left side of the menu bar has zoom and search options in every mode but Projects. You can use all of the usual iPhoto features in Full Screen mode, including edit, design, and sharing tools. Whether you're working on a Mac or a MacBook Air, you'll appreciate being able to take advantage of every last inch of precious screen real estate. Pick Your View: Get the most out of your screen by switching from iPhoto's regular view (top) to Full Screen mode (bottom). To edit an image in iPhoto, click the Edit button. There are three different Edit panes, each with a selection of options: Quick Fixes, Effects, and Adjust. Quick Fixes has six easy edits that will cover most casual photographers' needs. Effects contains fun and arty filters, as well as simple color and tone adjustments. The final tab, Adjust, contains the image's histogram and the advanced settings and sliders. At the bottom of each tab are two buttons if you want to backtrack one step or remove all edits and start from scratch: Revert To Original and Undo. Most photos only need freshening up in the Quick Fixes tab before you can print, upload, and e-mail them, or use them to create fun projects. Here's a rundown of the Quick Fixes controls. Rotate sideways snapshots Most cameras are pretty good at telling which end is up when taking a photo, but occasionally you'll end up with a photo turned on its side. When this happens, the Rotate tool (located in the Edit pane under Quick Fixes) makes quick work of turning things around. By default, the Rotate tool turns your photo counterclockwise in 90-degree increments. To instead move clockwise, simply hold down the Option key; the Rotate arrow will flip around. If you'd prefer iPhoto to rotate clockwise by default, you can change the setting by opening iPhoto's General preferences and choosing the clockwise rotation option. Have iPhoto make the fixes Before trying to do too much to an image yourself, give iPhoto's Enhance button a try. 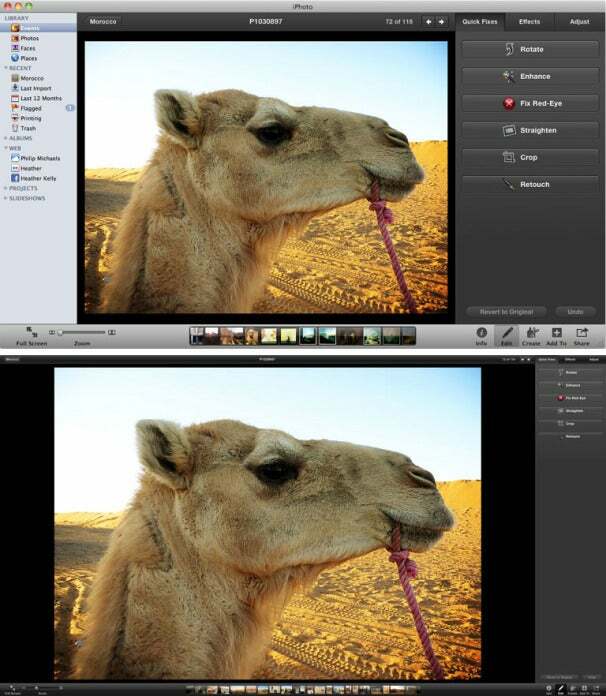 It automatically tweaks the colors and tone of your image to be their best. If you don't like the results, you can press the Undo button. But what if you want to fine-tune the results? You can. After clicking Enhance, go to the Adjust palette. You'll see that iPhoto tells you exactly what it did by moving the appropriate sliders in the Adjust palette. Not only can you learn how Enhance works its magic, you can fine-tune the results by further adjusting the sliders it moved. Remove red-eye To eliminate the bright red glow in your cousin's eyes, select the Fix Red-Eye tool. Start by clicking on the Auto option to see if iPhoto can do the work for you. 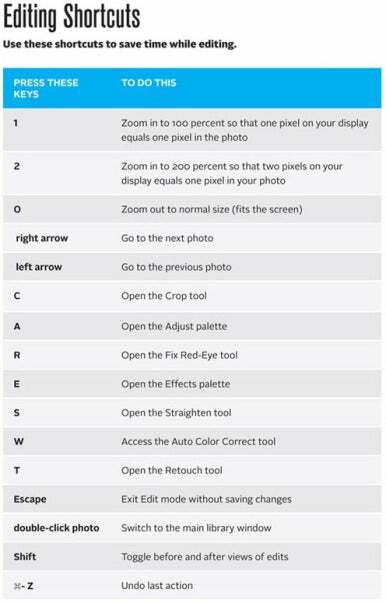 If you don't like the results of iPhoto's attempt, press Command-Z to undo the change and then use the manual controls. Move the Zoom slider at the bottom of the window to enlarge the image and then click in the center of each eye. If you're having trouble getting good results—for example, if the tool removes color from the surrounding area—try adjusting the size of the red-eye correction (see "Bye-bye, Red-eye"). Bye-bye, Red-eye: iPhoto's Fix Red-Eye button opens this helpful menu. You can use the slider to change the size of the correction. Straighten crooked photos If it looks like everything is about to topple off one side of your image, click on Straighten and use the resulting slider to level things out. 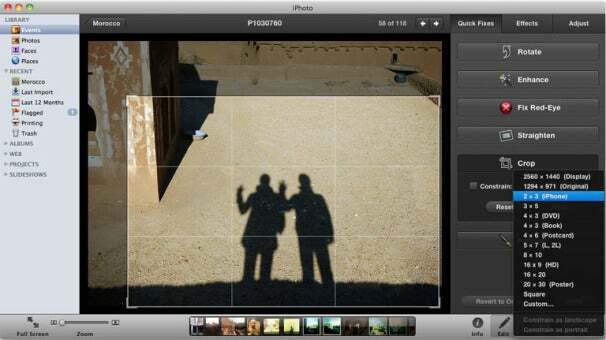 iPhoto places a grid over your image to help you gauge when a line is straight. Keep in mind that part of your image will be cropped in the process—so use this feature carefully. Crop out cluttered backgrounds If your photo's main subject is too small or appears overwhelmed by background details, the Crop tool can help you refocus the viewer's attention. When you click on the Crop button, located under Quick Fixes in the Edit pane, iPhoto places a white border around your image. Cropping will remove any part of your image outside this border. You can enlarge or reduce the cropping area by clicking on and dragging any corner. To crop to a specific dimension—for example, to create a 4-by-6-inch print—turn on the Constrain option and select the size from the pull-down menu. As you adjust the cropping area, you'll notice that iPhoto displays a grid, dividing the crop area into thirds horizontally and vertically. You can often improve the composition of a photo by placing its main subject along one of the inner lines of this grid. This composition technique is referred to as the "rule of thirds" (see "Cropping by the Rules"). Once you've set the cropping area, click on Apply, and iPhoto will trim the excess. Changes you make with the Crop tool appear everywhere the image appears, including books, calendars, prints, and smart albums. Cropping by the Rules: When you adjust a crop, iPhoto will overlay a grid onto the image that divides it into horizontal and vertical thirds. You don't need to use the Crop tool just to resize a photo for printing. To crop a photo for a specific print, instead use the resizing tool included in iPhoto's Print dialog box. Select the photo and choose File -> Print. Select your print template and click on Customize. Now click once on your image and use the resulting Zoom slider and hand tool to determine how much of the image appears. For more on cropping, see the "Improve Photos Fast with Cropping" section later in this chapter. Repair blemishes and other flaws The pictures from your birthday party would be perfect if only there weren't that bright red splotch in the center of your forehead! To try removing it, click on the Retouch button. Adjust the Size slider so that the selection area is just slightly larger than the blemish you're trying to eliminate, and then click once on the blemish—or click and drag to cover a larger area. (This also works with small wrinkles, scratches, or other imperfections.) iPhoto will attempt to remove the imperfection by blending the area with the surrounding pixels. But don't overdo it; the corrected area may begin to look blurred or may pick up odd colors from surrounding image details. If this happens, press Command-Z to undo the change. When you're done, click on the Retouch tool a second time to turn it off. Once you're in Edit mode, you might want a closer look at a particular area. This is handy if you want to gauge sharpness and quality, or fix a small flaw in your image. Place your cursor over the area that you want to magnify, then press the 1 key. iPhoto takes you to a 100 percent view of the very spot you want to see. Want to get even closer? Press the 2 key. Now you're at 200 percent. Whoa, too close? Just press the 0 key to return to the normal view (in which the image fits the screen). There are a few other basic edits that most images can benefit from. For these, you need to venture into the Adjust tab on the Edit menu. Most digital images will benefit from a little sharpening. Navigate to the Adjust palette and drag the Sharpness slider slightly to the right to make details crisper. But don't go too far, or you'll add too much contrast to the image and create unsightly artifacts. Keep in mind that no amount of sharpening will bring a truly blurred image back into focus. If your image shows digital noise—mottled specks that often result from high ISO settings—you'll want to be extracareful about sharpening. You'll often emphasize the noise in the process. And although iPhoto's Adjust palette offers a De-Noise option, we recommend skipping it. In most cases, this slider creates more problems than it solves. Many high-end image editors, such as Adobe Photoshop, Lightroom, and Camera Raw, and Apple's Aperture, have a vibrance (or vibrancy) control that lets you increase the richness of color in a photo without polluting the overall picture. As part of this wonderful feature, the skin tones are protected even while the environment becomes more rich and colorful. Vibrancy adjustments look more natural than increasing saturation. Fortunately, iPhoto also has a vibrancy slider—you just don't see it. To enable it, check the box labeled Avoid Saturating Skin Tones that's beneath the Saturation slider. By doing so, you change the behavior of the Saturation slider to that of a vibrancy slider. Even though its label remains the same, the results will be very different. Checking the box not only helps protect the skin tones from gaining odd color tints, it prevents the entire photo from becoming garish. Your boosted colors will look far more natural using vibrancy. It makes such an improvement, in fact, that you can leave the box checked all the time. Once you've made your edits and are satisfied with the results, you can click on the Done button (in windowed mode) or the X button (in Full Screen mode) to save your changes and exit Edit mode. Alternately, if you'd like to edit another photo, you can simply select a new image from the thumbnail slider. iPhoto will save your changes before moving on to the next image. Should you regret your editing decisions later, don't worry. iPhoto never writes over your original image. Instead, it merely keeps a record of edits you've made. That means you can always open the image in editing mode again and further fine-tune your settings. If you want to throw away all of your edits and start from scratch, you can do that as well. Simply control-click on the photo in your library and choose Revert To Original. iPhoto will turn back the clock to reveal your original image—flaws and all. Learn how to navigate and organize your photos using iPhoto.